The area (1236 ha) is located on the southern slopes of Meghri Mountain Ridge and include pick Kaladash. 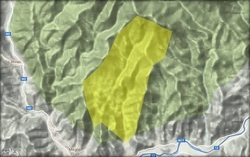 The elevation range occupied by area is from 588 to 2034 m above sea level. The average slope steepness of the area is from 15˚ to 35˚. The area includes wormwood semi-desert, variegated semi-desert, and scrubland semi-desert, true juniper woodland, and in some extends deciduous forest. Dominant vegetation among herbs are wormwood (Artemisia sp. ), Kochia sp., devil's-milk (Euphorbia sp. ), feather grass (Stipa sp. ); among scrubs are Atraphaxis sp., Christ's-thorn (Paliurus spina-christi), tragacanths (Astracantha sp. ); among trees are juniper (Juniperus polycarpos), hackberry (Celtis glabrata), oak (Quercus sp.) and hornbeam (Carpinus sp.). Although in low elevations the area is dry, at higher elevations it is moderately humid. Parnassius mnemosyne, Colias aurorina, Proterebia afra, Chazara briseis, Euphydrias aurinia, Pseudophilotes vicrama. The area has been neglected for conservation purposes and some plans on building waste water tailing pools have been proposed. Lower part of the area was used as a gravel quarry. In less extent the lower part is used for livestock grazing although in Soviet period the grazing was much more intensive in the area. The mentioned threats have negative influence on butterfly fauna of the area, especially such heavy threats as construction of tailing pools, which are destroying the habitat and adding a toxic waste in it. Traditional grazing at the area should not be considered as a current threat but a potential potential one, and might become dangerous with intensification of livestock husbandry. To secure conservation of the area it is important to add the territory into zone of strict protection and therefore to categorically prohibit any construction in the area. Therefore, alternative solution for the mining company should be revealed. The area has a great potential of wildlife tourism in the region and therefore needs to be developed in this direction. During 2014 a seminar with the staff of National Park Arevik (now Zangezur Biosphere Complex) has been conducted on management of the area; for development of ecotourism purposes - the personnel of the National Park was trained in species identification and trail guiding. The area is also included in network of Key Birding Sites of Armenia.